There are differences between degenerative (age-related, wear), inflammatory (joint degeneration by inflammatory arthritic desease, see below), traumatic (fracture, muscle or legement rupture) and posttraumatic disorders (joint incongruencies after healed fractures or bone necrosis, see below) of a joint. They all end in a joint incongruency, affecting daily painfree use. OSTEOARTHRITIS : This is an age-related “wear and tear” type of arthritis. It usually occurs in people 50 years of age and older, but may occur in younger people, too. The cartilage that cushions the bones wears away and the bones then rub against each other. Over time, the joint slowly becomes stiff and painful. Unfortunately, there is no way today to prevent the development of osteoarthritis. It is a common reason people undergo joint replacement surgery. Osteoarthritis may also be caused or accelerated by subtle irregularities in how the joint developed in childhood. RHEUMATOID ARTHRITIS : This is a disease in which the synovial membrane that surrounds the joint becomes inflammated and thickened. This is an autoimmune process that can damage the cartilage and eventually cause cartilage loss, pain, and stiffness. Rheumatoid arthritis is the most common form of a group of disorders termed “inflammatory arthritis". POST-TRAUMATIC ARTHRITIS : This can follow a serious joint injury like fractures and / or muscle/legamentous tears. Fractures of the bones that make up the joints may damage the articular cartilage over time resulting in joint incongruency followed by degeneration of the cartilage because of eccentric wear. This can causes pain and limited joint function. ROTATOR CUFF TEAR ARTHROPATHY : A patient with a very large, long-standing rotator cuff tear may develop a condition called cuff tear arthropathy due to the lack of muscle stability and protection, leading to bone to bone contact. In this condition, the changes in the shoulder joint due to the rotator cuff tear may lead to arthritis and destruction of the joint cartilage. This rotator cuff tear can be of traumatic origin or most commonly due to tendon degeneration over the years. AVASCULAR NECROSIS (OSTEONECROSIS) :Avascular necrosis is a painful condition that occurs when the blood supply to the bone is disrupted. 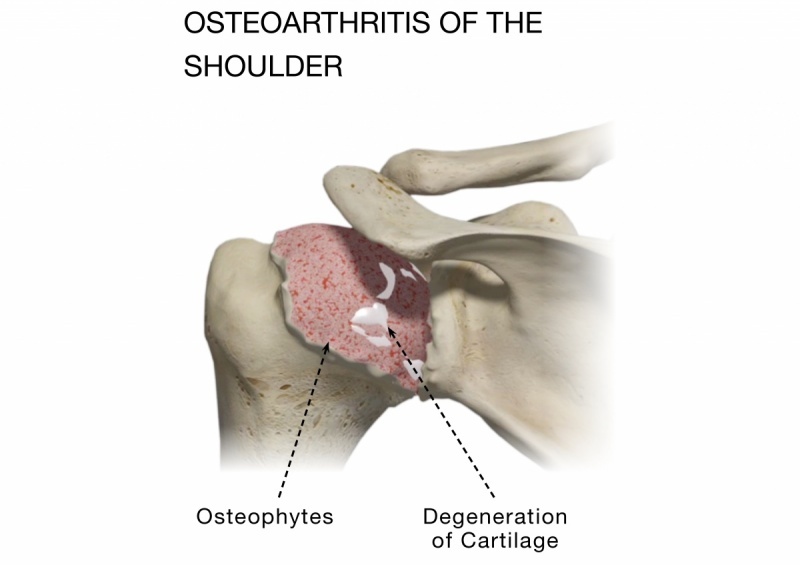 Because bone cells die without sufficient blood supply, osteonecrosis can ultimately cause destruction of the shoulder joint and lead to arthritis. Chronic steroid use, deep sea diving, severe fracture of the shoulder, sickle cell disease, and heavy alcohol use are risk factors for avascular necrosis.